Bahrain-based importer Grip Machinery reports it has seen phenomenal growth ever since it partnered with US-based Chesterton Company, a leading manufacturer and distributor of heavy industrial solutions products of fluid sealing systems, high performance protective coatings and lubricants for rotating and static equipment. Hussain Abdulla Hamza, managing director of Grip Machinery, said sales have gone up by 400 per cent in 2015 compared with the previous year. Hamza said Chesterton has a great reputation and presence in the Gulf region within all industrial sectors. “Now, Chesterton has qualified Grip as a Certified Mechanical Sealing Service Centre, which definitely gives our business a boost due to its brand name and our capabilities,” said Hamza. Grip Machinery mainly deals in electro-mechanical services as well as renovation services for rotating and static equipment for all types of industries. It aims to increase the life cycle of machinery by providing better quality products that can also be replaced with minimal down-time, thus saving manufacturers a lot of money, explained Hamza. “Earlier, if a sealing device failed in service, the whole machine had to be taken apart in order to replace the seal which sometimes takes days. 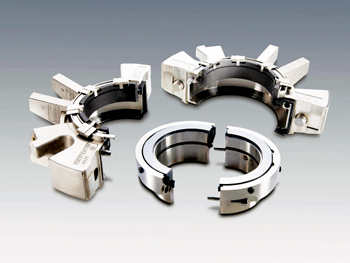 With Chesterton’s unique Cartridge Split Mechanical Seal Technology, which can fit into all machines, the end-user can easily replace the seal and re-commission the machine within just 5 to 10 minutes without removing the machine,” he said. In terms of packing material, Grip imports high performance mechanical packing. This packing combines with unique sealing properties to make it more longlasting. These kinds of materials are used in all pumps/valves/mixers types of oil and gas, drilling, power, marine, steel, pulp and paper and food industries and all other heavy industrial sectors. Grip derives 50 per cent of its revenue from the oil and gas industry and 20 per cent from the power industry with the remainder distributed among the other sectors. It counts many of Bahrain’s biggest companies as well as several government ministries as its partners. Hamza is confident that the client list will only grow in the next few years as businesses warm up to the concept of installing higher quality products in their manufacturing facilities, rather than the price-sensitive ones currently being used. Grip provides services for renovating and rejuvenating machinery equipment at its service centre, which houses some of the most sophisticated/best quality tools available in the market. Here, the company can remove the gunk formed over years of use on any machine, gearing or seal so that it works most efficiently. “The kind of equipment we are dealing with helps in transporting and containing the manufacturer’s resource, such as gas or liquid. So the more efficient the seal or container is, the less of the resource is wasted,” Hamza explained.